Continuity Tester is an important tool while you wiring up a circuit, repairing an electronic device and for any other electronic related Operations. This circuit have an advantage over ordinary CONTINUITY testing Device, usually we are using multimeter to check the continuity of a circuit. It is not suitable to check the continuity of a circuit with high Impedence or resistance like Transformer, Capacitors, and even for high value Resistors. This circuit helps you to determine whether the device or electronic component is working fine And by using this SIMPLE CONTINUITY TESTER you can repair any damaged electronic devices easily [By identifying the actual fault of the device]. The circuit uses only an NPN transistor(BC 107), with a Current Limiting Resistor and an Indicator LED. The circuit is powered by a 6V battery. Connect the terminals A and B to any electronic component or circuit which is to be tested. 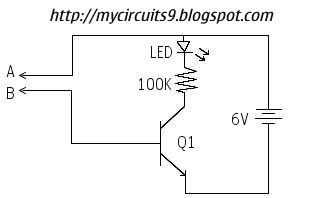 The LED will glow if the circuit having a continuous path or the component is working finely. Otherwise the LED remains OFF. How to identify the fault of an electronic device using this continuity tester? As Described above, Connect the terminal A&B in the circuit to each component of your device. And locate the damaged and replace it with new one. Don't repair a device which is connected to the mains power supply. This circuit will burst out or cause you serious harms whenever they get contacts with AC supply. Can I use a diode in place of the TR Q1 ?